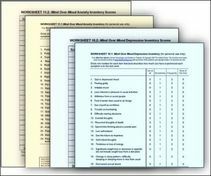 LOOKING FOR THE NEW 2ND EDITION WORKSHEETS? View a sample chapter and learn how to download HERE. Our thanks to the publisher Guilford Press for permitting us to post these worksheets here for your non-commercial personal use. If you wish to link to this page, please see our "How to link to MOM1 Worksheets" section posted below. 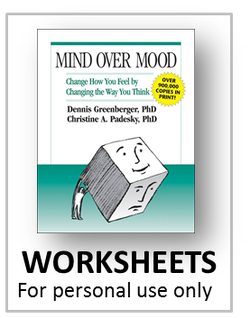 ​The 7-Column Thought Record was developed by Christine A. Padesky, PhD in the late 1970's. It appeared in the first edition of the Mind Over Mood book with a copyright of 1983. Unfortunately some websites have taken this form without authorization and added their copyright to it. In some cases, they also have made minor changes to the Thought Record. We encourage you to use the the form we provide here as it perfectly coordinates with the book and adheres to copyright laws. This is the original, official and correct 7 Column Thought Record. Please respect copyright. Thank you. DO NOT LINK DIRECTLY to the PDF documents since the location of the worksheets may be changed during site reorganizations.